Happy New Year! As 2018 dawns, complete with its day one Wolf Super Moon to kick us into its oncoming action, I am just going to take a moment to recap on the year that was. 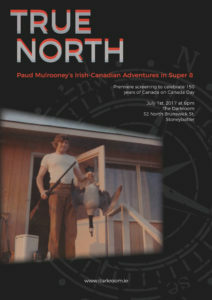 Maybe he is though – but in another form… For example, I managed to do a quasi-posthumous collaboration with my Dad in “True North: Paud Mulrooney’s Irish-Canadian Adventures in Super 8” which we showed at his second funeral (the first was in Toronto, where we were grateful to receive extraordinary support from the community there), in the back bedroom of the house he built during his summer holidays in Coosheen, Kilkee County Clare, on June 24th. 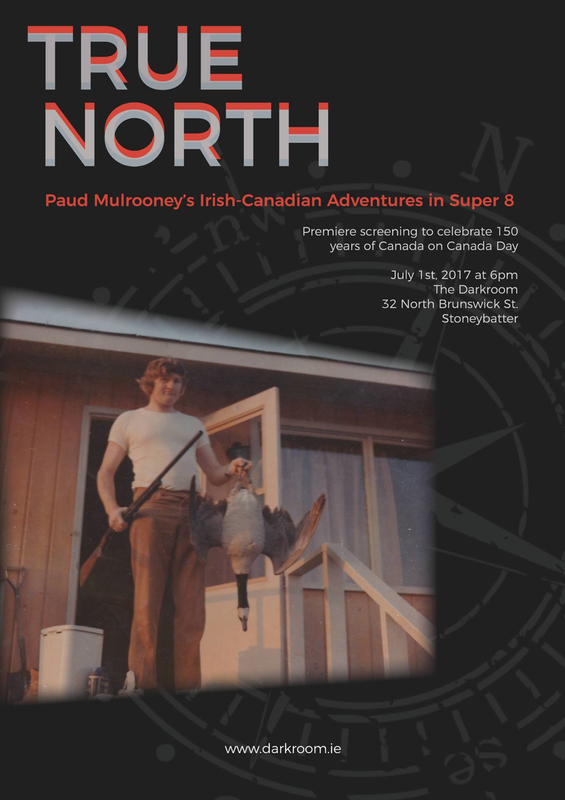 A week later, on July 1st, Canada Day, celebrating 150 years of Canada, we screened the film in Dublin’s Dark Room, followed by a fascinating Q & A hosted by Dennis Kenny, co-founder of Dublin’s Super 8 Festival. I’m delighted to say that this unique film collaboration has also been selected for the Belgrade-Irish Festival in Serbia, in March 2018. More of which anon! 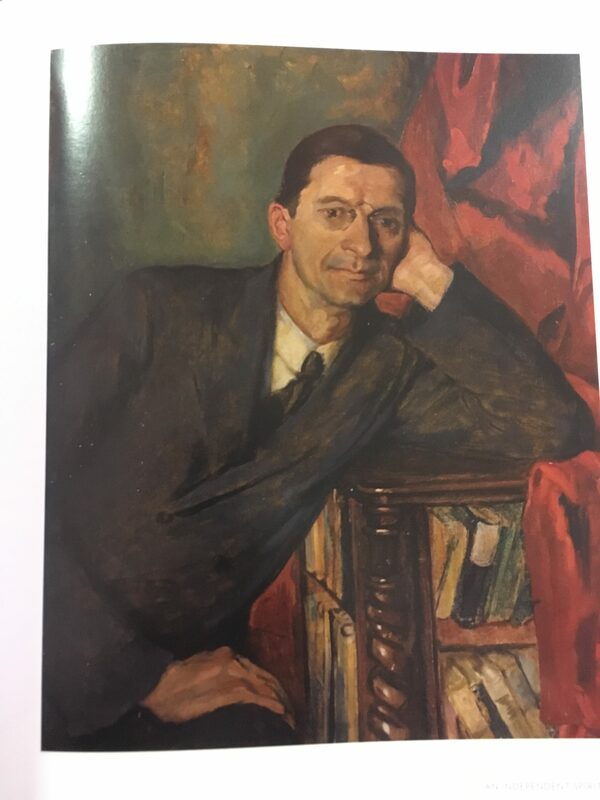 Meanwhile, on March 17th, my BAI-funded feature radio documentary “Surrender on Grand Canal Street”, about Eamon De Valera’s alleged 1916 surrender on my Grand Canal Street Windowsill aired on Newstalk 106 – 108fm. 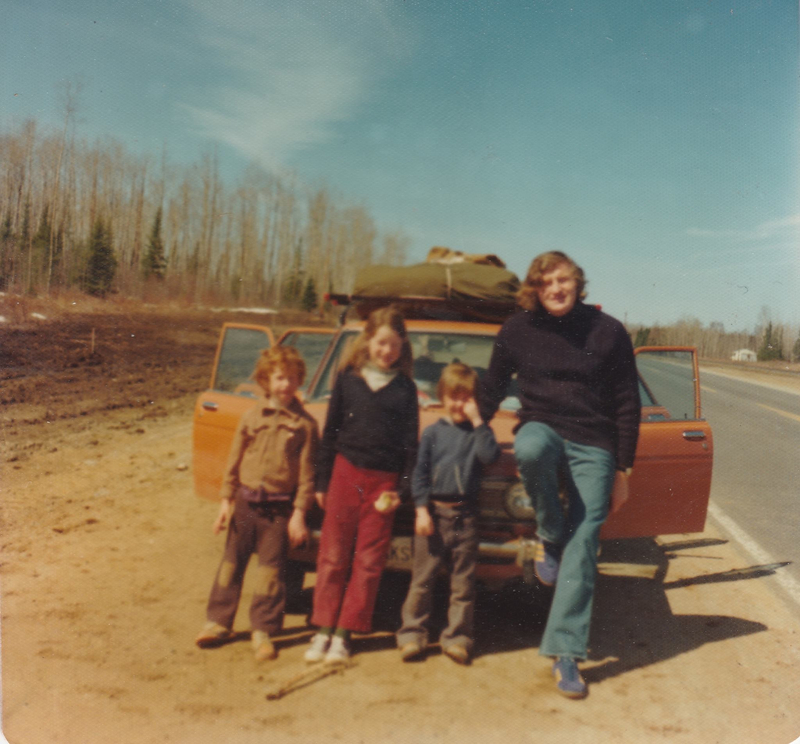 I was also happy, and honoured that my TG4 Splanc documentary Dance Emergency/ Damhsa na hEigeandala made its Canadian premiere at the 1st Irish Film Festival Ottawa, followed by a live Face Time Q & A (that was fun, from my couch in Dublin to the auditorium in Ottawa), in March. 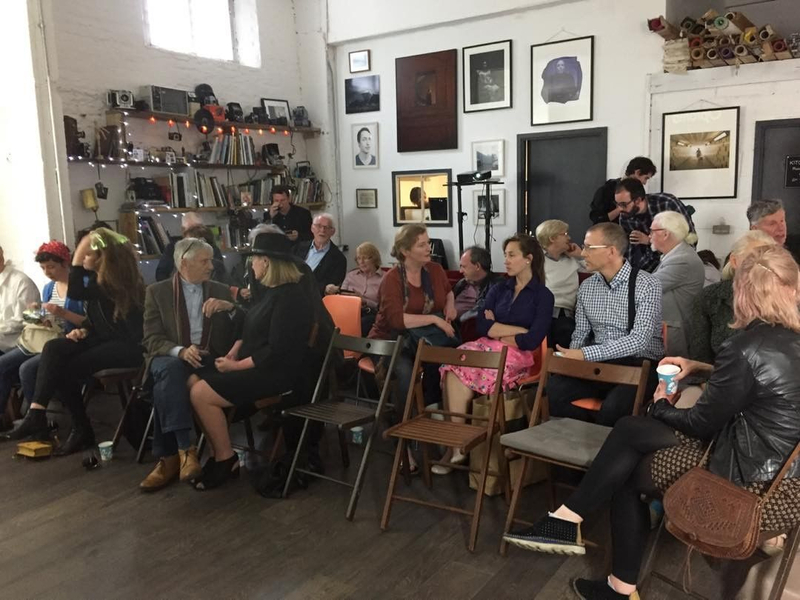 In the meantime I was producing and directing a short film project with Oliver Sears of Dublin’s Oliver Sears Gallery on the London premiere of painter Colin Davidson’s powerful exhibition “Jerusalem”, at Fitzroy Square, which premiered at 92y.org in New York in September 2017. Rob Doggett (SUNY) introduces “Georgie’s Vision” discussion at The New School, NYC. Photo: Youngmin Kim. Back in the world of WB Yeats, I really enjoyed contributing on the topic of George Yeats and the Esoteric to “Sunset Birth”, curated by Linder Sterling on the Spoken Word Stage at Irish Museum of Modern Art’s Summer Party. Following on from this, in October, the visual version of my documentary “Georgie’s Vision”, the first ever about the fascinating Mrs. WB Yeats premiered in New York as part of the International Yeats Society Conference at The New School. I was thrilled to hear positive feedback from the world’s top Yeats scholars on my work there. In the meantime, after a hiatus of several years, I was delighted to resume lecturing in Irish Theatre, this time to the lively students at Dublin’s Gaiety School of Acting – a welcome activity which is set to continue in 2018. It’s remarkable to me how through my original research projects, and general societal change, my own thought has evolved on the Irish theatrical canon since the last time I had the pleasure of teaching this fantastic topic. Looking ahead to 2018, it’s an honour to be the first Visiting Research Fellow at University of Limerick’s Centre for Irish-German Studies. 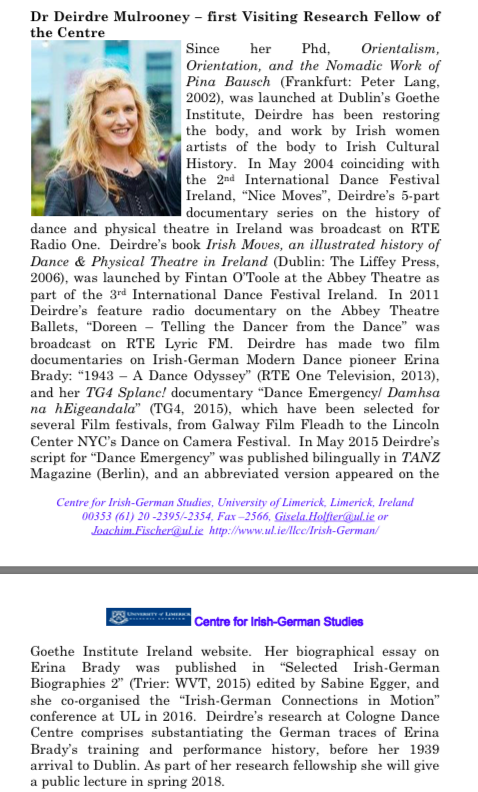 As part of this I’ll be undertaking to write an essay updating my research on Erina Brady, to substantiate her German training and experience prior to coming to Ireland, at University of Cologne’s Dance Archive and Centre for Dance Studies where I’m also Visiting Scholar. The essay is to be part of a forthcoming publication ensuing from the “Irish-German Connections in Motion” conference that I co-organised at University of Limerick in November 2016. I’ll also be giving a public lecture on my ongoing research at University of Limerick this Spring. 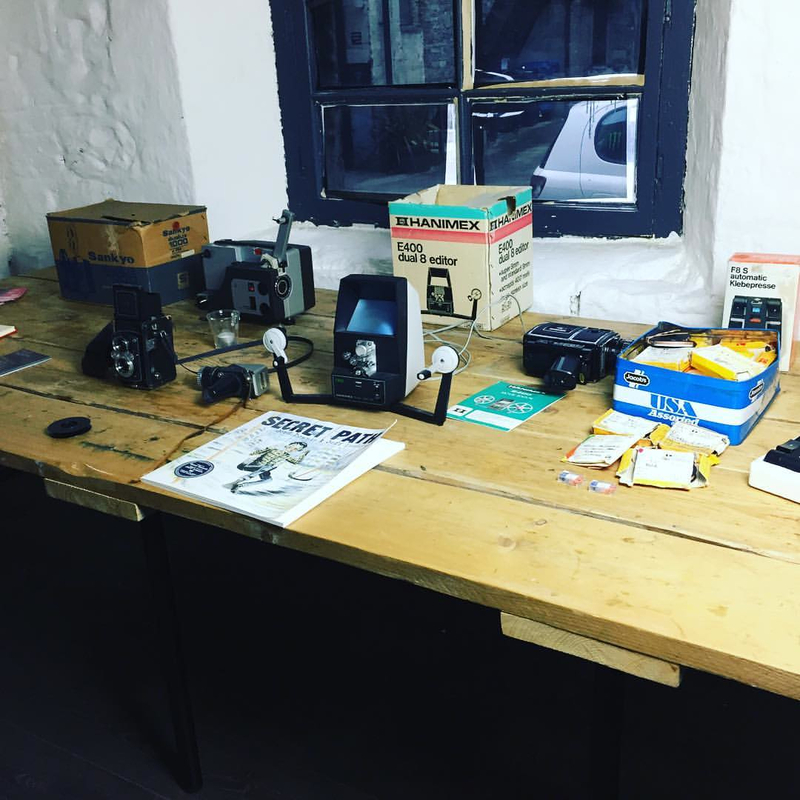 There are also many other projects underway which I can’t talk about right now, so fingers crossed for an interesting, productive, and creative year ahead! 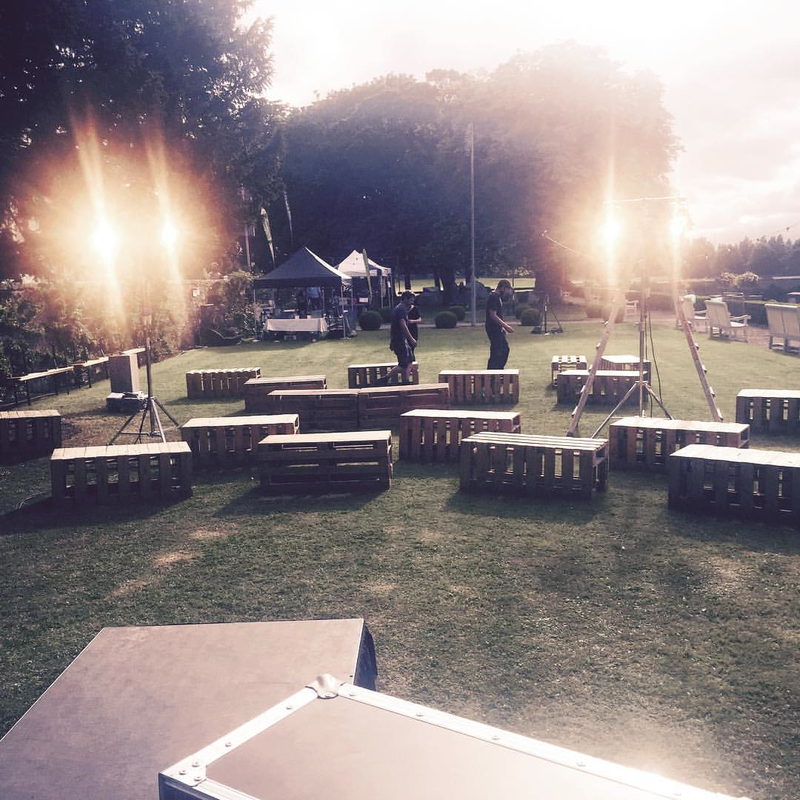 I will keep you posted on the progress here as events unfold… So watch this space!